Dinosaur Comics - May 6th, 2016 - awesome fun times! –Oh snap, here come the profits! 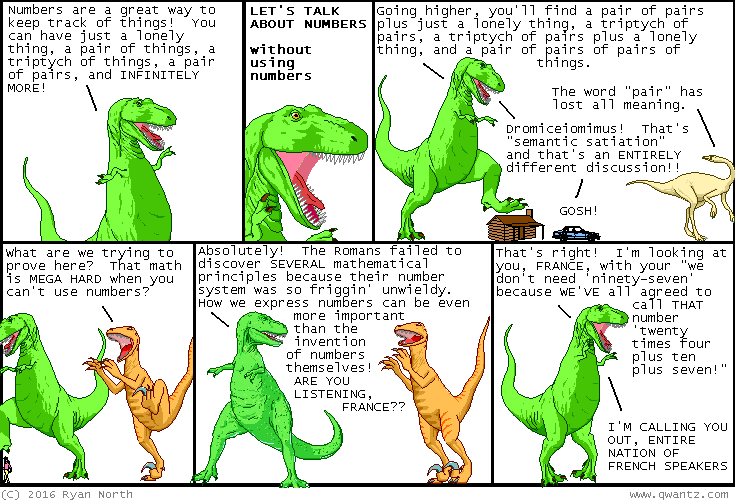 May 6th, 2016: Okay so the coolest thing I got emailed to me after yesterday's comic was the idea that counting ISN'T math when we do it (because we're doing it by rote) but it IS math when birds do it (because they're reasoning through the process and reaching conclusions based on mathematical laws). I LOVE THIS IDEA SO MUCH. Nobody tell me if it's a bad idea because I love it.